The name of the request can be edited here. Displays the structure of the web service. Double-click on the name of the web service or click on the to show the next level of the WSDL structure. 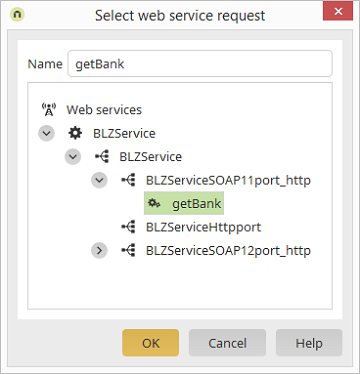 The name that the web service is registered with in the WSDL description is shown under the name of the web service. This is followed by the available ports and bindings. The operations are shown at the bottom level. If an operation is selected, it will automatically be added to the Name field.